GQA Qualifications: WILTSHIRE COLLEGE AND SALISBURY GLASS COLLABORATION GETS RESULTS! WILTSHIRE COLLEGE AND SALISBURY GLASS COLLABORATION GETS RESULTS! The long-standing collaboration between Wiltshire College and Salisbury Glass, developed over the past ten years, has led to another group of eighteen successful students receiving their Level 2 qualifications. Martin Sadler from GQA Qualifications Authority came along to present the Salisbury Glass members of staff with their certificates. The GQA is the Awarding Organisation for qualifications in the glass industry. 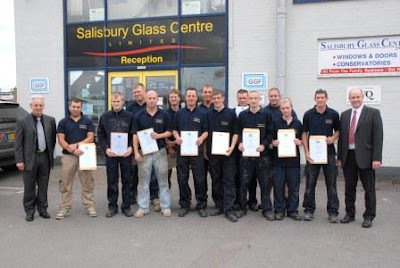 Salisbury Glass continues its commitment to staff training and promoting from within. It recognises the need for its workforce to achieve a level 2 qualification, which facilitates trade workers obtaining a CSCS card, as this is the industry standard required to work on most building sites. Wiltshire College and Salisbury Glass hope this success will encourage staff to progress on to a Level 3 supervisory qualification, at an appropriate point in the future.